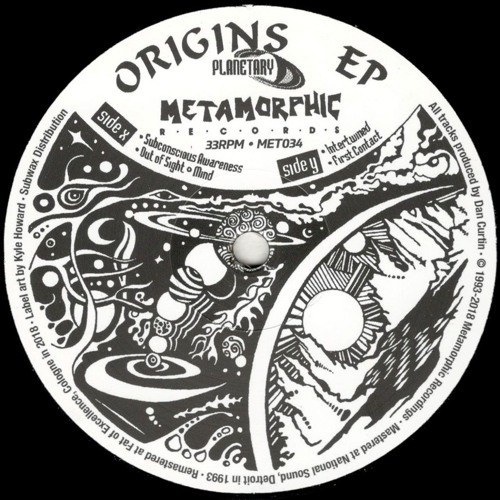 Artist: Planetary Title: Origins EP Label: Metamorphic Recordings Cat No: MET034 Format: 12” Vinyl Only Tracklist: x1. Subconscious Awareness x2. Out of Sight and Mind y1. Intertwined y2. First Contact By popular demand we are excitedly reissuing the 3rd release from Metamorphic, Origins EP by Planetary, carefully remastered from the original DAT recordings! In the interest of preserving the original mood of the release here is the text from the 1993 press release for this record... “In the time before ideas when human life was not even a consideration evolution began. Water from a turbulent sky flowed off virgin Earth into the pools and rivers of creation Meteors coursing the the heavens were intercepted by the mother in order to bring to her the elements needed for her primordial cauldron. “Origins” by Planetary brings you to this genesis. Your mind swims through the primeval ocean warm with life creation and you witness the beginning. When the music stops your mind and body return to the world of the sentient but you never forget your Origins. Still fresh and hot as in 1993! Brilliant!